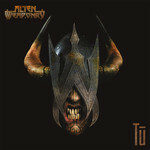 The debut album from local three-piece thrash metal group Alien Weaponry. Formed by brothers Lewis and Henry de Jong in 2010, their songwriting is complex, developed and highly political. Lewis and Henry are of Ngati Pikiāo and Ngati Raukawa descent - they call themselves 'Stealth Māori'. They attended a full immersion Kura Kaupapa Māori (Māori language school) until they were seven years old, where singing waiata and haka performances were a daily routine. Also ingrained in their early learning were stories of New Zealand history from a Māori perspective. In September 2017, Alien Weaponry won the prestigious APRA Maioha Award for their song 'Raupatu' - a thrash metal commentary on the 1863 act of parliament that allowed the colonial government to confiscate vast areas of land from the indigenous Māori people. They were also nominated for Best Māori Artist at the 2017 VNZMAs.